Throughout its curriculum, Merry Lea’s graduate program in environmental education integrates ecological learning and pedagogical skills. You will study the ecology of the southern Great Lakes region and then refine your skills to transfer that knowledge to students of all ages. Education is, by nature, interdisciplinary and integrates many fields. Environmental education adds the natural sciences by incorporating ecology, biology, chemistry, and physical/outdoor education into curricula. The program at Merry Lea will challenge you every day and we trust that the reward is a renewed sense of wonder and confidence in your ability to bring people across the globe closer to the natural world. The degree is built around four major components: seven core courses, one seminar style course, an immersion in ecosystem studies, an extensive practicum and a multi-faceted final project. A variety of seminars and integrative sessions supplement these experiences. The core courses provide content and the fundamental skills to understand, preserve and manage natural resources. You will also develop your interpersonal skills enabling you to be an effective leader and create challenging, safe and fun learning environments. 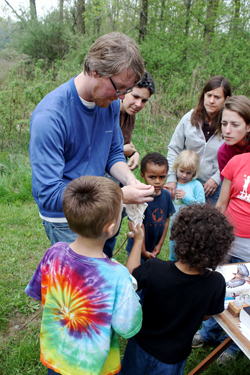 Professor: Jonathon Schramm, Ph.D., Goshen College Sustainability & Environmental Ed. Dept. A study of the plants and animals of this region and the ecosystems in which they are found. Emphasis on 1) interrelationships in ecosystems, 2) the function of ecosystems, both how they operate and how they impact surrounding systems and humans, and 3) identity of the organisms that comprise the ecological community. Students will investigate the ecological relationships of the organisms identified as well as behaviors and life cycles. Professor: Dave Ostergren, Ph.D., Director of the master’s program. 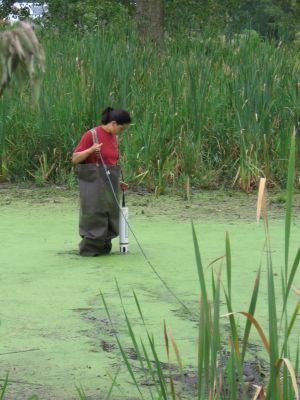 This course investigates a wide range of research strategies that an environmental educator may use and/or encounter in the course of their career. The applied approach is primarily as a leader or director who is either evaluating an existing program, or designing a new program. We will also review and interpret both qualitative and quantitative studies (i.e. gathering information on people or natural resources) in ecological, social, and educational research and spend significant time conceptualizing your 11 month-long MA project. Professor: Joel Pontius, Ph.D. Goshen College Sustainability & Environmental Ed. Dept. A study of distinctive concepts and skills needed for delivering quality environmental education programs, built on a constructivist and applied educational model. The following themes will be part of the course: field-based and experiential education, inquiry and questioning, interpretation, settings, responsive instruction and program design, assessment and evaluation, and learner outcomes. Students will gain experience designing environmental education curricula through projects in the course. A study of current environmental issues facing society. Topics include ethics, citizenry, environmental justice, theological implications and organizations addressing issues. The various facets of the history of environmental education and outdoor education will be reviewed. A study of important literature relevant to all topics will be included. This is a survey course on the essential skills and practices in leadership and administration of non-profit organizations. Topics include personnel management, strategic planning, personality styles, financial and resource management, budget preparation, board utilization, fundraising and capital campaign, day-to-day functioning of a nature center, and team development. This is a study of both the theory and practice of managing the “place” for various ecological functions and human values that enhance an environmental education experience. Includes how land management practices need to reflect the economic/social/spiritual values of humans, and the biological functions of the ecosystems it encompasses. Environmental quality and care for creation are emerging as important components to faith, peace and justice across the globe. Creation care provides that we should build on spiritual and theological foundations to care for God’s creation. Environmental justice is the equitable distribution of costs and benefits from utilizing resources to all people regardless of class, generation, ethnic origin or gender. This seminar is a survey course of these topics. Located on Andros Island in the Bahamas, this three-week, immersion style, cross-cultural, experience is designed to learn about a new ecosystem, work with Bahamians interculturally, and design EE curriculum within an international context (CLICK HERE for more info). Participants will investigate a broad spectrum of opportunities and challenges for international non-profits delivering EE to local students, and/or in conjunction with tourism. The tourism on Andros Island is low key compared to the more developed islands, and features an immense coral reef and a 1,000+ sq. mile national park. 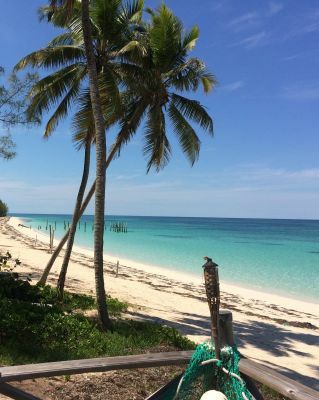 Although the stay is relatively brief, students will work with the Andros Conservancy and Trust (founded in 1999) to design place-based curriculum; learn about the relationships between NGOs, government agencies, and businesses; apply natural history skills in a different ecosystem; and investigate first hand the implications of of climate change on an island nation. Being part of the delivery of Merry Lea’s preK-12 onsite and outreach programs in environmental education will fulfill the practicum in three major programming time blocks giving students experience in multiple programs. Students will also have opportunities in specialty programs, such as summer camps and public programs. Assessment of student performance will occur after each of the programming time blocks and as part of the final evaluation. In Professional Field Studies we travel throughout the region to introduce students to a wide range of programs, nature centers, pedagogies, leadership styles, and management strategies in environmental education (EE). We also investigate critical issues in EE and the decision making process that will effect them, as educators, throughout their career. Two to four faculty travel with the cohort to investigate the interdisciplinary nature of EE, and the variations that EE may take. Each student develops professional connections, practical resources, and through written reflections an understanding of EE in the broadest sense. Your project is intended to be driven by your passion and interest in a topic within one of following themes: a) an environmental issue b) an ecological problem, or c) pedagogical challenges and possible solutions. The Creative Project is just that: a look into a challenging issue that requires creative insight. You will have FOUR major components: 1) The work itself whether you are conducting a question driven investigation, or you are problem solving with an organization; 2) A major, thesis length paper; 3) Curriculum designed for two distinct audiences, and: 4) a presentation. This is an applied experience and project that can be useful long into your career. Occasional short-term experiences round out your education and contribute to the portfolio you create. Among these are a two-day Wilderness First Aid workshop, a Nature Photography Workshop and the annual Environmental Education Association of Indiana conference.